Raise your hand if you think that Zazzle is mainly t-shirts. For some reason, that’s how I always think of them. My family has ordered MANY personalized Disney shirts through Zazzle for various family vacations. However, Zazzle is NOT just Disney shirts (although some of us might be okay with that!). They actually have many different products that you can customize with their images, their text, your own images, or your own text. My family was asked to pick out a product to have Zazzle make for us in order for us to review it. 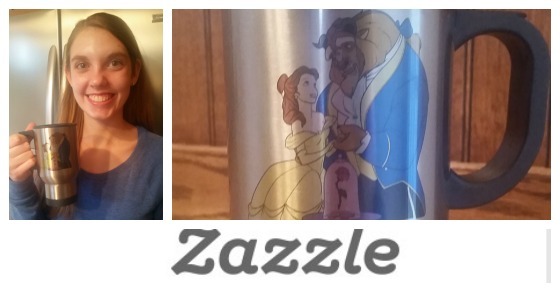 My daughter loves Beauty and the Beast so we picked out a metal travel mug. As you can see from the video below, my daughter loved it. She was particularly excited that the travel mug would fit in the cup holder because those are the only types of cups the kids are allowed to use in the family room! One of the other products that we didn’t order but that was really cool was the Instagram mug. You can choose pictures from your Instagram account and Zazzle will create a collage out of them. What a fun way to turn those images into something that you can actually hold and keep forever. They have so many cute products that you can find something for anyone on your gift list. Create a Santa Plate for Christmas Eve or even Edible Frosting Rounds for the tops of cupcakes. They have a huge line of home products like pillows, mugs, totes, canvas prints, and wrapping paper. They also have customized iPhone and iPad cases. For the office, get business cards, mousepads, or Post-it Notes. Planning a party or wedding? Let Zazzle customize your invitations, favor boxes, thank you cards, and more. Zazzle tends to run a lot of great deals on their site and they change frequently. So be sure to check out Sunshine Rewards for Zazzle coupons and cash back.